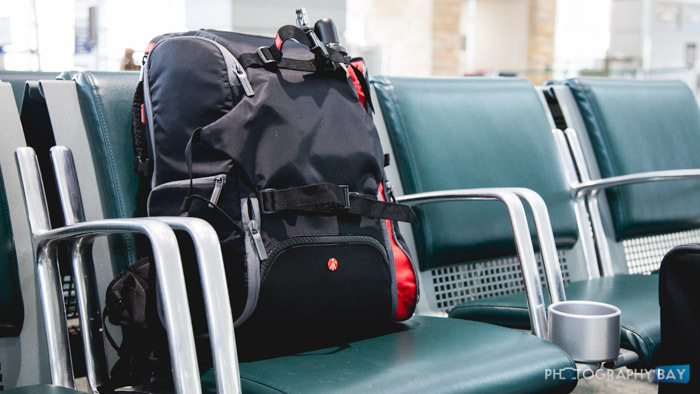 The Manfrotto Advanced Travel Backpack is a versatile backpack that certainly lives up to its name as a travel backpack. It gets most things right and a few things very right. 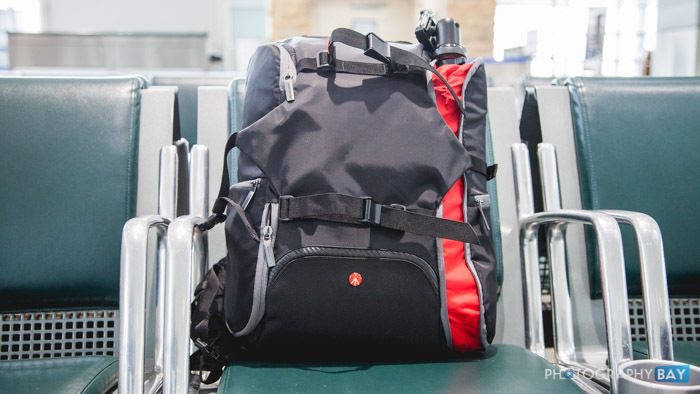 The backpack is similar to the sling-style bags we have seen in recent years from Lowepro in that equipment is stowed and accessed from the side of the bag. There are two compartments – on upper and one lower. One single zipper runs from top to bottom though, so you can access both compartments at once. The lower section houses a DSLR with lens attached, as well as a spare lens or two and a flash or other accessories. I had no problem fitting a 5D Mark II with EF 24-105mm f/4L lens attached, a EF 50mm f/1.4, a couple of chargers and several accessories in the bottom compartment alone. 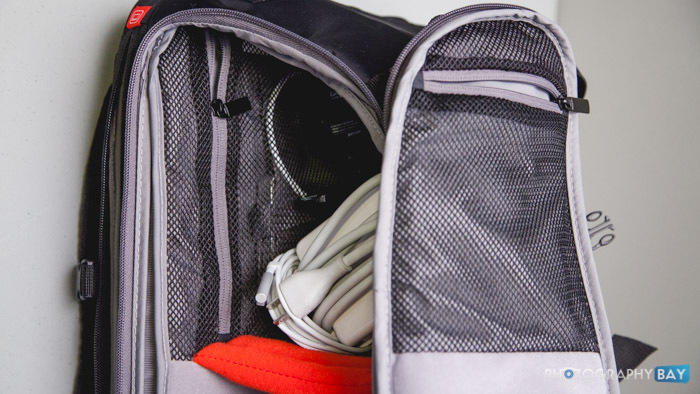 The top compartment is a general gear area with a couple of mesh pockets. I used those to stow hard drives, cables, timer remotes, pens and such. In the main compartment area, I stuffed a ton of gear, including a GoPro and suction cup mount, MacBook charger, memory card cases, Gorillapods and studio headphones. I was truly surprised at how much I could fit into this bag. I love the tripod compartment on the exterior of this bag. 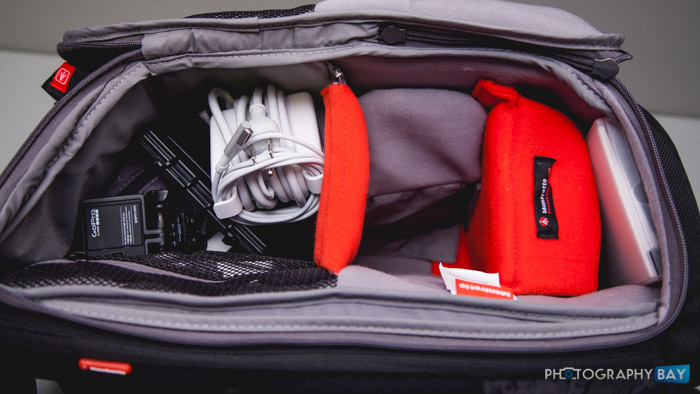 While you can attach a tripod to the rear of the bag using the dedicated tripod straps, Manfrotto put an expandable tripod pouch on one side of the bag to handle its BeFree Compact Travel Tripod. Of course, any compact tripod will fit just fine in there. The great thing about the tripod compartment is that it keeps the tripod secure form top to bottom. There is no worry about the tripod catching on something as you make your way down an airplane aisle or through a crowded city street. Big kudos to Manfrotto on this very smart feature. The specs say that the laptop compartment will carry a 13″ laptop. 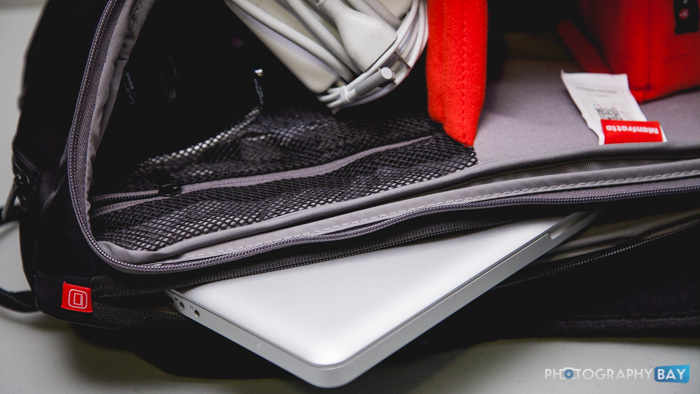 However, I had no problem carrying a 15″ MacBook Pro and an iPad Air within the laptop compartment. Go figure. The bag has an exterior pocket on each side. Honestly, they are both a bit on the small size and the zippers are not up to snuff (however, the zippers on the main compartments and tripod pouch are good). I had to force an Evian water bottle into one of the pockets and, while it didn’t fall out, I worried that it would and continued to check on its status as I walked around NYC shooting time-lapses. Honestly, these pockets are best served for business cards, memory cards, lens cloths and the like. There is also a top compartment on the bag’s exterior that has enough room for a passport or wallet, but not much else. Overall, the bag could use an upgrade in the number of pockets and could use some dedicated pen and memory card pouches. 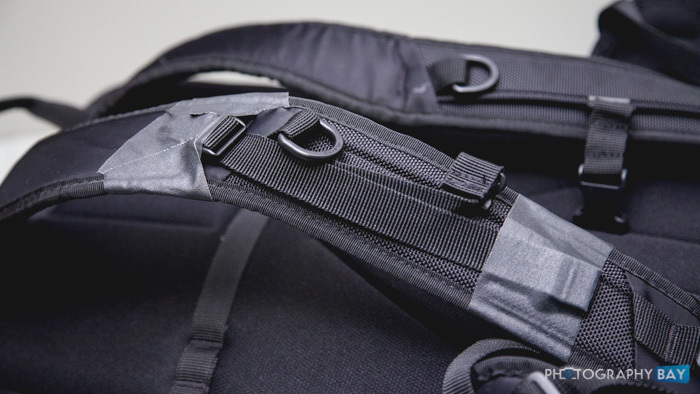 On the back of the backpack is a small luggage strap for securing your bag onto your luggage. There are two security straps on the bags sides. They are the standard plastic fastener variety. On the gear compartment side, the presence of the strap provides an extra comfort level for the security of your gear. Straps are in place for both waist level and chest level support for extended treks. While these work fine, I don’t use them all of the time. I wish there was a way to stow the straps away (or completely remove it) when not in use – particularly the chest strap. The dangling strap constantly gets in my way by working itself under the right-side should strap whenever I put the bag on. One of the great things about the bag is that it is easy to access gear while the bag remains on your left shoulder. You can simply swing the bag around, grab your camera and then swing it back onto your right shoulder. The darn chest strap slides under my shoulder strap every time. I finally just taped it down with gaff tape and it no longer torments me. Manfrotto also includes a dedicated rain cover, which will likely only need in heavy rain situations. The material of the bag itself is durable and weather resistant. I had no worries walking around in a steady drizzle with the bag on my back. 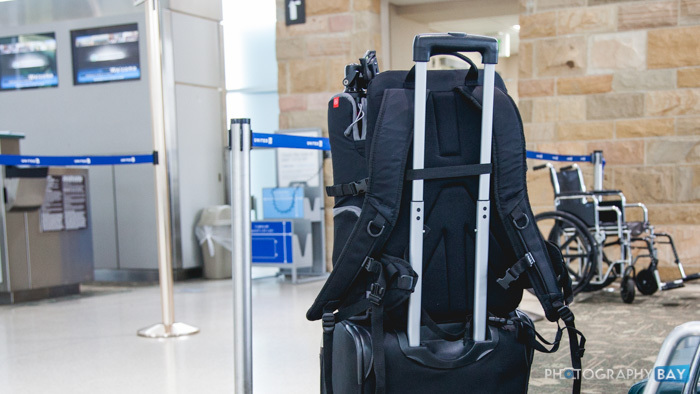 Overall, the Manfrotto Advanced Travel Backpack is an excellent bag. 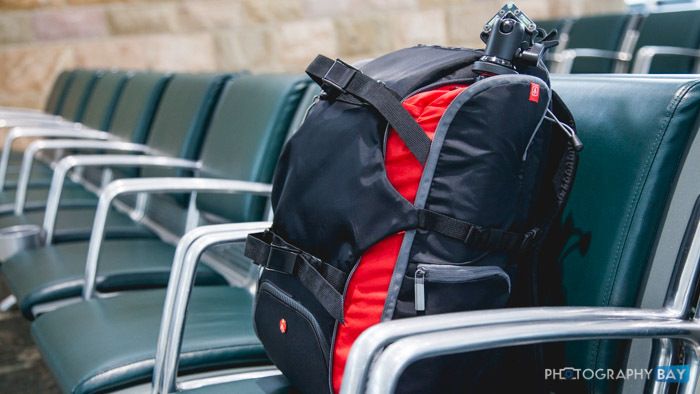 It has a couple of minor quibbles; however, I still highly recommend it to anyone needing a versatile camera bag for travel. I have even been using it as a daily carry bag and it continues to grow on me. Check it out here at B&H Photo. The backpack is also available as a kit with Manfrotto’s BeFree Compact Travel Tripod, which you can find here at B&H Photo. By making your photography purchases through these links, you are helping Photography Bay to continue bring quality camera and photo gear tests, news and reviews. Thanks for your continued support. I’ve had this backpack almost a month now, I love it BUT it keeps falling towards -don’t know how to say it in English. Either empty, half loaded or fully loaded, it always ends up facing towards the floor. It can’t keep straight. Does it happen to anyone else?